Located on Prahova River Valley, at the foot of Varful cu Dor, Furnica and Piatra Arsa Mountains, Sinaia resort covers an area from Gura Padurii to the North, to “Vadul Cerbului” inn, to Izvorul Dorului, and to the new quarter called “Platoul Izvor”. Also called the Pearl of the Carpathian Mountains, Sinaia is located at an altitude between 767m and 860m, and besides the wonderful landscapes, it offers the possibility of practicing winter sports. 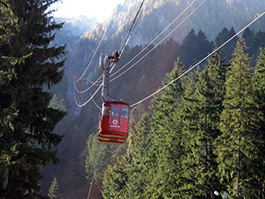 The access to the ski slopes in the resort is possible by taking the cable car to Cota 1400 and then to Cota 2000. 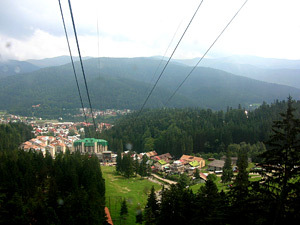 Sinaia resort, general view from cable car. The Tourist Information and Promotion Center, located in a building in the Mayoralty yard, offers complete information about the touristic activity. 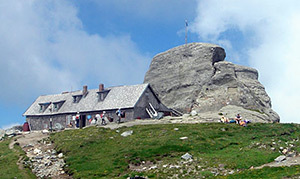 The ”Salvamont” Mountain Rescue Public Service also has its headquarters here. Among the main attraction points we can enumerate The Peles Castle, Pelisorul, Gara Regala (the Royal train station), Sinaia Monastery, Sinaia Casino, “George Enescu” memorial house, the “Luminis” villa in Cumpatu quarter, Nicolae Iorga’s house (on 1 Ghe. Doja Street), Anastasie Simu’s house, a great lover and collector of Romanian pieces of art (on 68 M. Kogalniceanu Street. 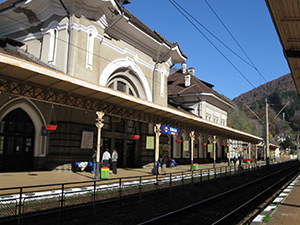 The train station in Sinaia was built in 1913, and at the beginning of the 20th century here stopped important international trains, like Orient Express or Arlberg Express. On the platform there is a plaque built in the memory of the Romanian Prime Minister I. Gh. Duca, killed by legionaries in 1933. The second train station, Gara Regala (the Royal train station), was built in 1939 and it was for the trains transporting the Royal family. At that time, the insignias of Carol II were on the building. In the central room there was a square mural painting, with sides of 5.5 metres, presenting o royal hunting, and which had a Latin inscription: Voivode Basarab, the 14th century. The official destination of the Royal train station was kept also during Communism, the American president Gerald Ford passing by in 1975. Nowadays the train station is not open to the public. 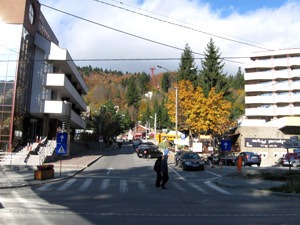 Street that leads to cable car, Sinaia. 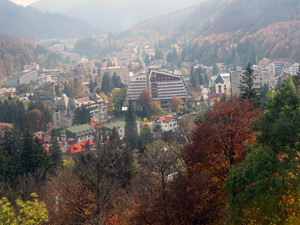 Built between 1912 and 1913, at Carol I’s wish, Sinaia Casino is located in the “Dimitri Ghica” Park. The first shareholder was Baron of Marcay, shareholder at Monte-Carlo Casino, after whose plans Sinaia Casino was built as well. After a short period of time it entered the circuit of the greatest casinos in the world, special trains bringing the gamblers in the resort. During the ‘30s it became the main attraction point of the resort, what brought the economic and social development of the town as well. It is said that, at that time, there were at least 800 persons per day that “visited” the Casino. After 1947 the building became Casa de Cultura (the House of culture), where were organized plays, folkloric performances and concerts. Only in 1975 it was completely renovated and used for international meetings. 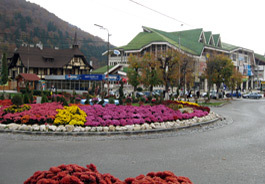 Nowadays, Sinaia Casino houses the International Conference Center which is in charge of organizing conferences, symposiums, congresses, having all sorts of modern facilities: high speed internet, four international telephone lines, simultaneous translation, interprets, parking lots and so on. Sala Oglinzilor (the Mirrors Room) can shelter a 500 person reception. Salonul Oval (the Oval Salon) has a capacity of 240 places. Salonul cu Struguri (the Grape Salon) is for fewer than 60 person reunions. Sala de teatru (The theatre room) has 400 seats, and there are also two protocol rooms and two conference rooms. 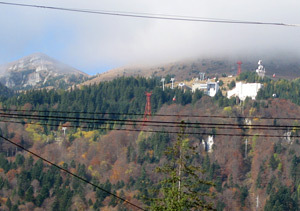 Cota 1400 viewed from Sinaia. 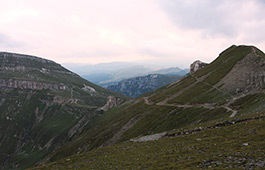 One can get to Sinaia both on the railway and on the road. 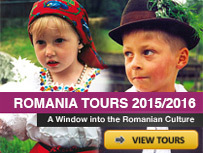 One can take the train from all corners of the country, passing through Brasov or Ploiesti. The trains stop in the train station located between Prahova River and Caraiman hotel. 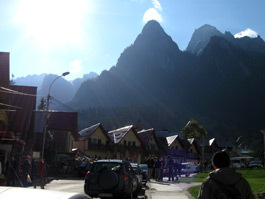 On the road, one can come from Bucharest, on DN1 (E60) highway, or from Brasov. Then, on DN71 road, from Targoviste, through Pucioasa, Fieni, Moroieni one reaches the South part of the resort, between the Izvorul Dorului bridge and the stadium of the town. Situated on Prahova Valley, 135 km away from Bucharest and 37 km away from Brasov, at an altitude of 800-900 m, Busteni health resort offers, in every season, the best conditions to spend the vacation, the holydays, and the week-end in an amazing mountain frame. 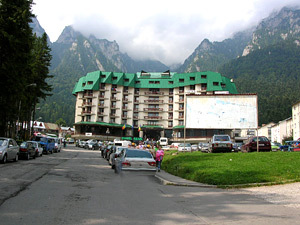 Busteni resort – Silva Hotel. 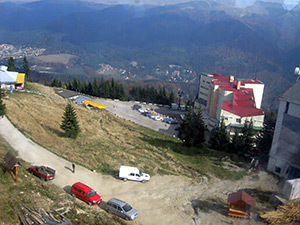 Protected by Caraiman Mountains (2384m ) and Costila Mountains (2489 m) and crossed by the Prahova river, the resort distinguish itself through its picturesque surroundings and through the possibility of practicing various forms of tourism: mountain trips, mountaineering, winter sports, chalets. 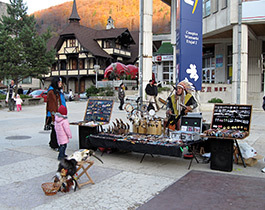 There are a lot of hotels, chalets which are at tourists’ disposal. 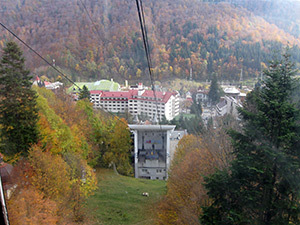 Busteni resort, general view from cable car. 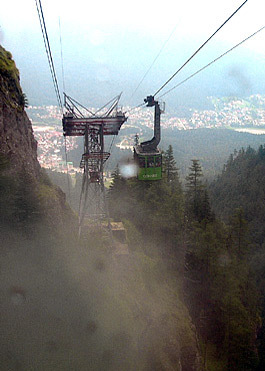 A cable car climbs from Hotel Silva to Cabana Babele, on the top of the mountains. 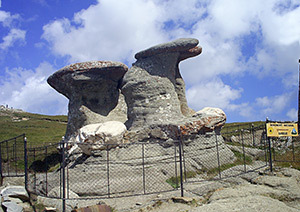 This area features unusual rock formations like Sfinxul and Babele. 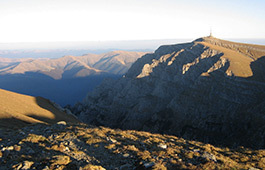 Omu Peak is the tallest in the Bucegi Mountains, 2504 meters. If the weather is nice, you can admire spectacular views of Prahova Valley. Busteni resort represents one of the starting points to mountain trips, on the most attractive lines in Bucegi Mountain Mass. The most important lines, that offer the tourists amazing natural monuments, are: Busteni-Valea Urlatoare Mare-Urlatoarea Waterfall (1 hour on foot); Busteni-Gura Dihamului Chalet-Diham Chalet (3 hours); Busteni-Pichetu Rosu-Omu Chalet (6-7 hours, in winter the road is accessible only till Pichetu Rosu); Busteni-Poiana Costilei-Malaiesti Chalet (in winter, the road is accessible only for mountaineers and skilled skiers); Busteni-Cantonul Jepi-Piatra Arsa Chalet-Caraiman Chalet-Babele Chalet (5-6 hours, the road is accessible in winter only for trained tourists). 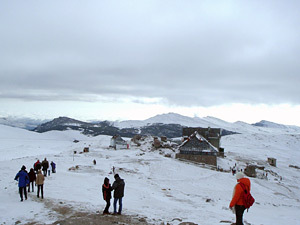 In winter, the tourists can ski and sledge. There are even ski slopes with different difficulty levels. For the beginners in skiing and sledging, the slopes at the foot of the Zamora Mountain are recommended. The skilled skiers have the slopes from the Bucegi plateau and the outskirts of the Babele and Caraiman chalets at their disposal. 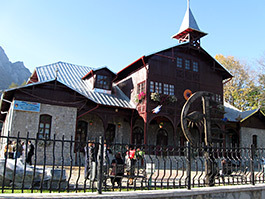 In Busteni town, there are some places which may raise the tourists’ interest: ”Cezar Petrescu” memorial museum that presents the writer’s life and activity, “Ultima grenada”(the last grenade) monument, which is dedicated to the hero Vasile Musat, who died in the First World War,The House Of Culture, The trout stock farm. 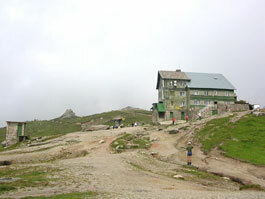 Omu Chalet is located at an altitude of 2505 m.
The Meteorological Station from Vf. 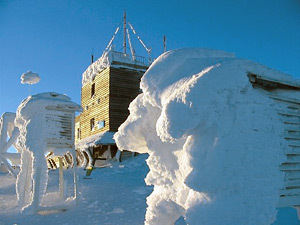 Omu.It is situated in Bucegi Mountain Mass and it’s one of the few meteorological station in Europe that lies at such a high altitude (2507 m) , with human craft working inside it. Because of her geographical position, it is hit by all the air masses and that is very important, because the atmospheric fronts can be detected, and so the evolution of the weather can be predicted. 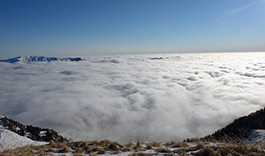 At this height, 2507 m, one may see half of the country if the sky is cloudless: you can see lights of Bucharest during the night, the Eastern Carpathians, the Western Carpathians. The Meteorological Station from Vf. Omu. 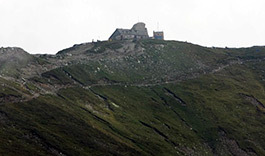 The Meteorological Station Babele is situated at 2200 m altitude and it’s a station that holds a radioactivity programme concerning the environment. Observing the evolution of a meteorological phenomenon from Babele station , the station at Omu Peak Mountain and Sinaia station (1500 m altitude) , comparative observations cam be made regarding the same phenomenon: wind, the air temperature, atmospheric precipitations . Thus, if it happens to be a cloud break at Babele, at Omu might rain, but at Sinaia it might not rain at all. If you leave Babele station in full winter, you may find out another season when you get to Sinaia. 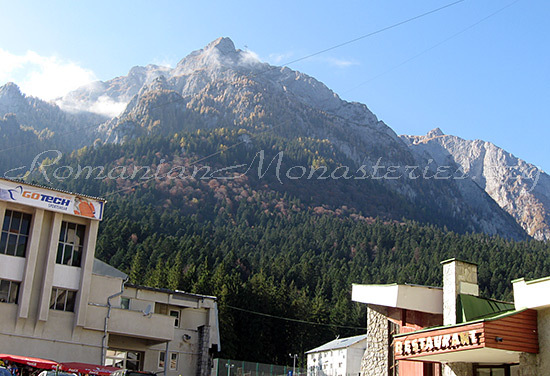 After the wind passes the mountain ridges, it increases its speed on the way to Prahova Valley, so when it reaches Caraiman Chalet or the piers of the cable railway that transports people from Busteni to Babele, the wind reaches the maximum speed. That explains how the roof of the Caraiman Challet was torn out many times and that the cable railway cannot work, even if at the upper station the working conditions of the cable railway are satisfied. All of these assure us of the great importance of Babele meteorological station. 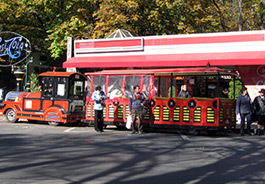 A special train carrying tourists through the Sinaia resort. 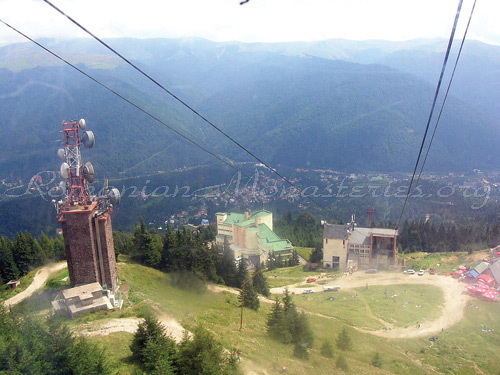 Sinaia, general view from 2000 m.
Indian who sing in the center of Sinaia. Busteni under the snow, general view from cable car. 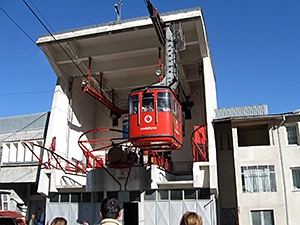 The building of cable car – Busteni. 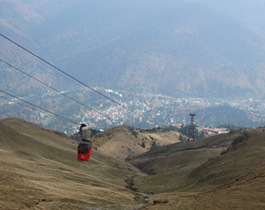 Busteni Cable Car who climbs to Babele. 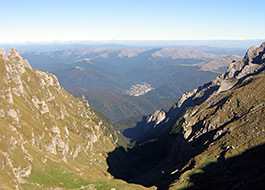 View from Omu Peak, 2505 m.
Cerbului Valley viewed from Omu Peak. 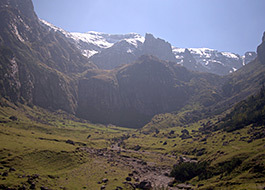 View from the Malaiesti Valley to Omu Peak, 2505 m.
Busteni, the road to cable car. Casa de Cultura – Busteni. There are 3 towns in that zone and these are Sinaia, Busteni, and Azuga. 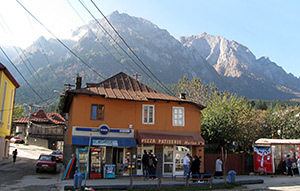 In Busteni it will take you 2-3 days depending on what you want to visit ( Mountain – 2 days , and other monuments 1 day ). 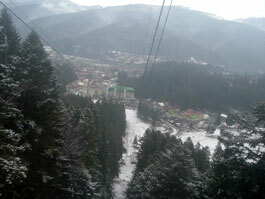 Sinaia has wonderful places too and Azuga, if you travel in winter, has a nice slope for skying. 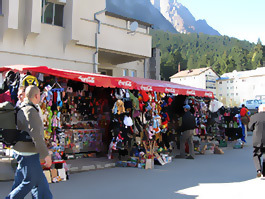 Advice if you go on mountain : buy everything you need from town. It will cost you double up there. 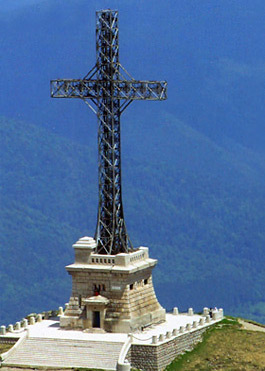 Do you have any sujeston for traveling the Bucegi Mountain (Babele, Gavanele, Sfinxul, WWI memorial cross, Omul) and Bustini. How many days we need for visiting there,? Would you please tell me the timetable about the cable car from Bustini to Babele and return. “Urlatoarea” (the screamer in english) waterfall is about 10 meters high. It’s not huge but it’s great: so refreshing in the summer and nice to see in the winter (when a part of it freezes). I don’t know how much water is there in the summer but it’s enough to give 1/8 of Busteni the water it needs. and how mach water there in summer. i mean quantity in Meter kubic? Nu-mi vine sa cred ca avem locuri asa frumoase in Romania. Chiar am trecut pe la Busteni si Bran, e super. Multumiri celor care sa-u gandit sa faca toate astea. These pictures are very cool . I’m in sixth grade and my friend and I are making a report on Romania. We have the places of the Parlament Palace, the Heroe’s Cross, The Palace of the Romanian Residence Patriarch, and the Stone Arch. Hope to come here soon!